Toronto Audi incentives | Audi Downtown Toronto Audi Dealer ON. Whatever your automotive needs, it’s worth your while to check back here often and ensure you benefit from the finest Audi specials and promotions in Toronto and the GTA! 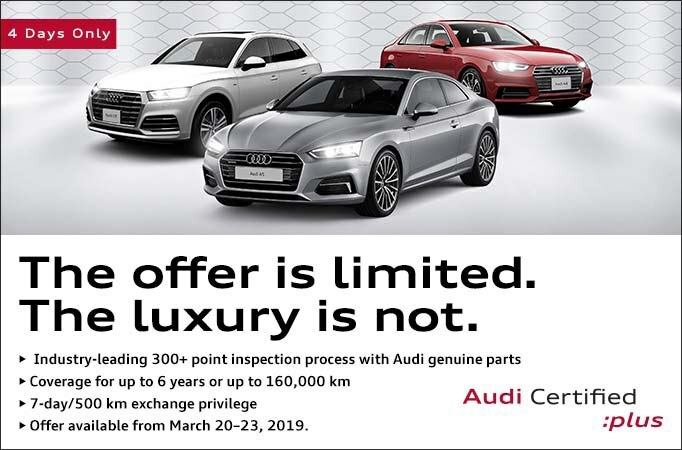 Audi Downtown Toronto offers special Audi deals on new Audi models in stock, selected used vehicles, service and parts and accessories on a regular basis, because we believe you deserve to get the most value when fulfilling your automotive needs, always! Take a moment as well to consult the current offers from Audi Canada, which could mean a super low interest rate, rebate or discount on your next purchase of a new Audi. Take advantage of our Audi promotions today!